This week's five AHAs are from the AHAbook™ Getting Booked as an Empowerment Speaker. 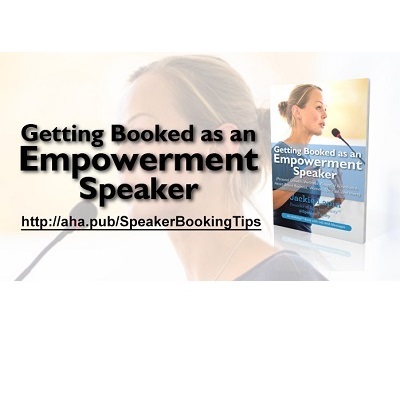 Please share this URL "aha.pub/SpeakerBookingTips" in your social media status update to let your friends know about it. If your business isn't growing, it's because you don't have enough visibility. There are people out there just waiting for what you offer, but to find and attract them, you need to have a steady stream of speaking engagements, radio shows, podcasts, and virtual summit appearances. Jackie Lapin @SpeakerTunity, a leader in helping innovators connect with their followers, shares this insightful AHAbook that is ideal for personal growth experts, authors, coaches, holistic healing practitioners, intuitives, spiritual teachers, and people offering skills to build a heart-based business. If you have a message and a mission to deliver it, you’ll find this treasure trove of wisdom as your secret to increasing your visibility and demand. In no time, you'll be on the stages, shows, and summits where you will attract your next reader, client, or student. To see and learn how to automatically share AHAmessages from this book, you may check out this video: https://youtu.be/YYgNCJVJVLE. To learn how to automatically share via AHAblaster, please watch: https://youtu.be/zUHcer5UYEU.